I thought before November is over and Christmas, in my view anyway, officially begins I would share my favourite colour that I have been wearing throughout the Autumn months! This would Burnt Orange or Rust whatever you want to call it that Autumn leafy tone is what I have been drawn to lately and it's even more exciting when I can match it to my surroundings. As you can see from this first outfit I managed to find an orange building that not only toned in with my outfit but was also covered in heaps of crunchy leaves - hours of endless fun! 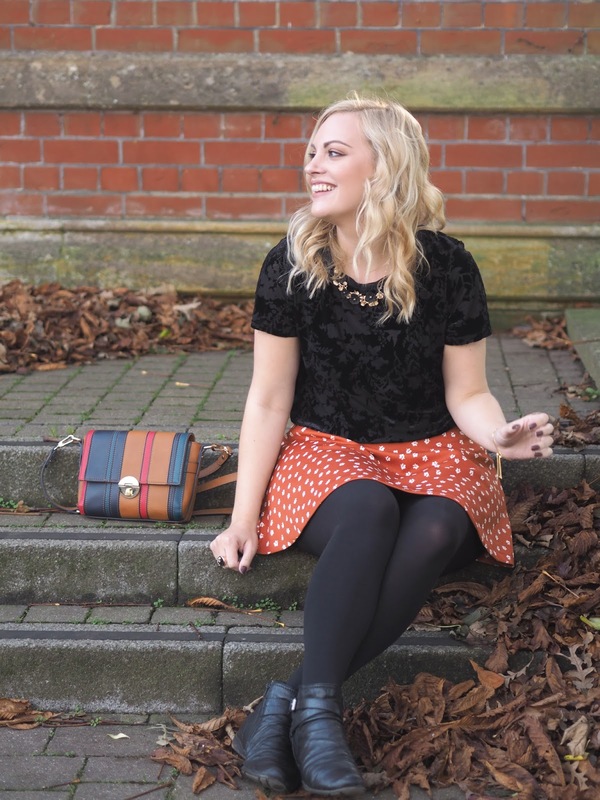 The star of the show is my new skater skirt from Yumi which is a real bright Autumnal Orange shade scattered with little white flowers. 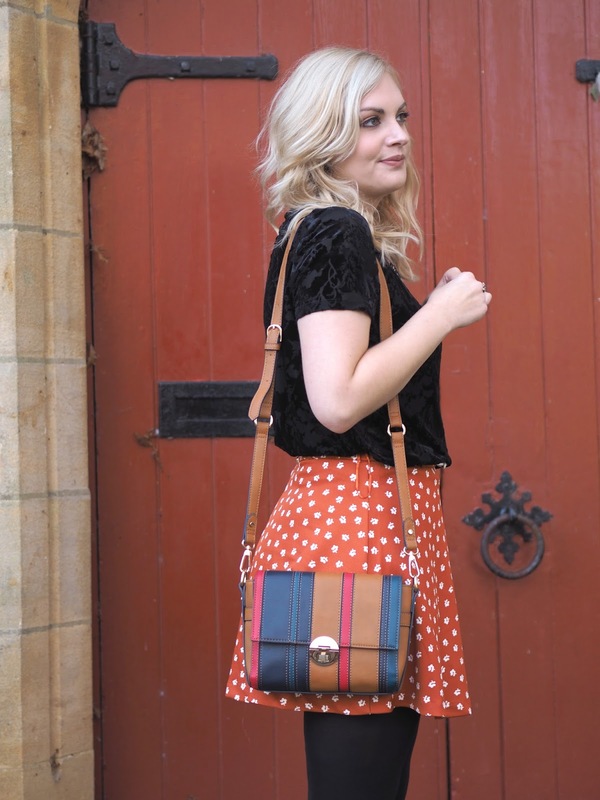 Use my code: KATIE10 at the checkout for 10% off anything at Yumi.co.uk. I paired it with this gorgeous Velvet T-Shirt from Oasis which I think adds a bit of a luxe feel. 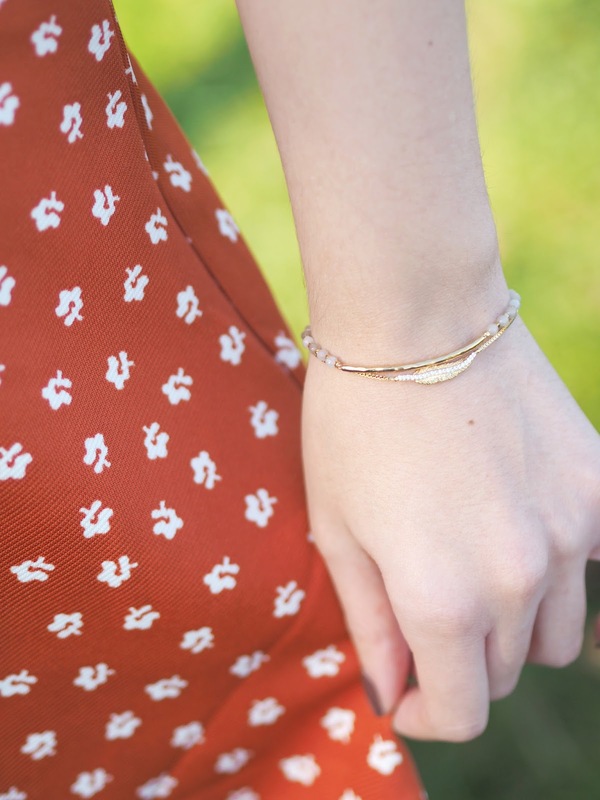 My jewellery is also new and I felt matched in with the style of the outfit perfectly. 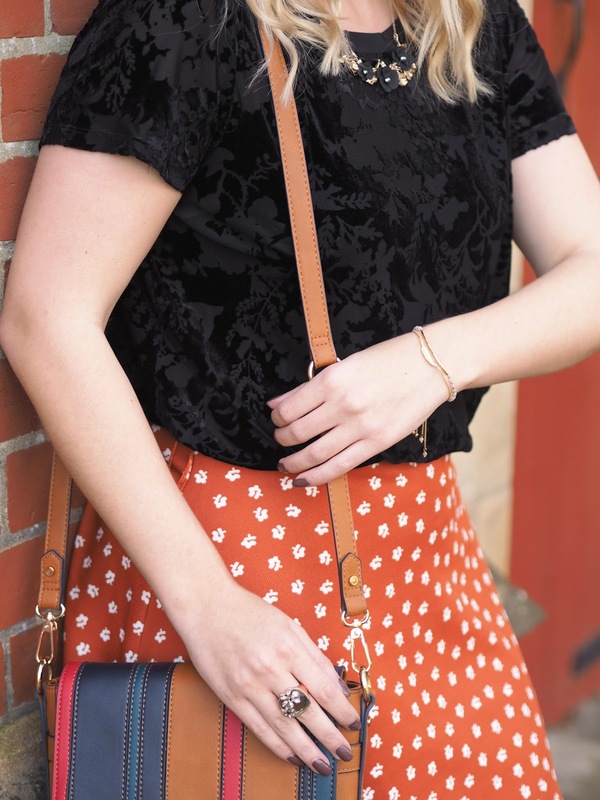 Outfit Details: Velvet Burnout Tee | Orange Skirt | Ankle Boots | Bag (similar) | Floral Necklace & Matching Earrings | Bracelets | Rings. 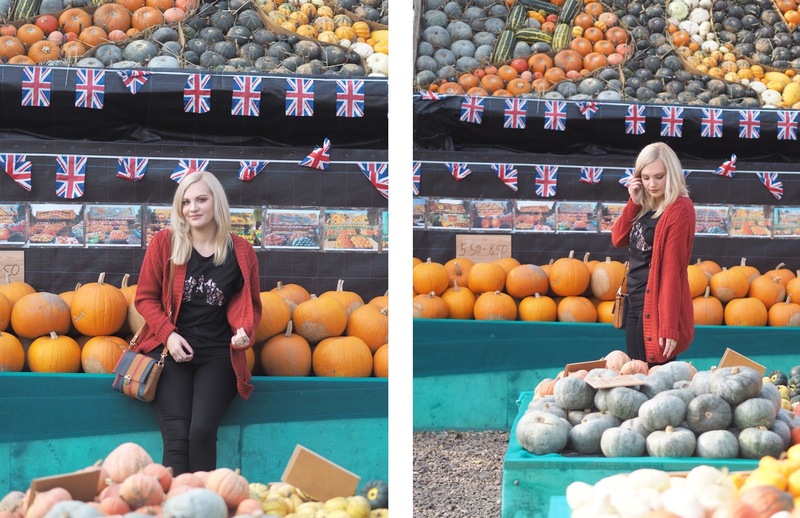 This second outfit is a throwback to when I went to pick pumpkins at Slindon Pumpkin farm. 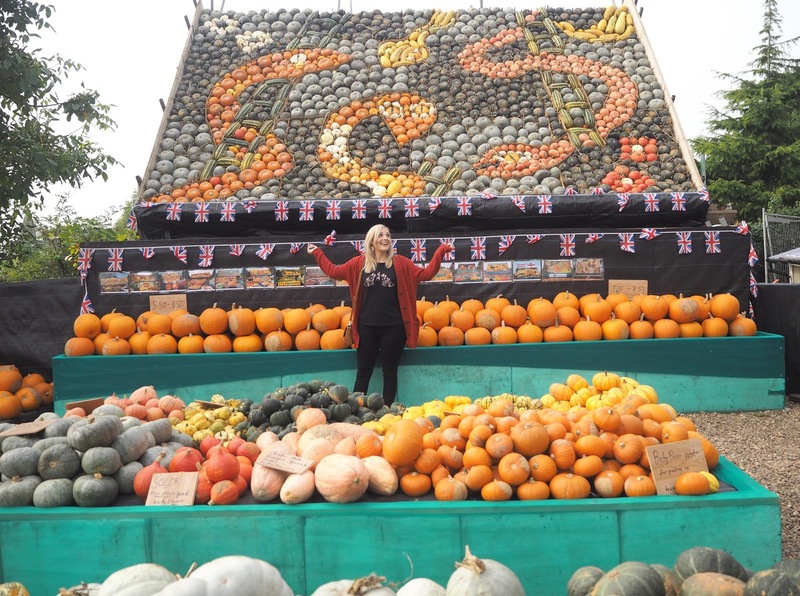 Maybe some will say it's too late to post pumpkin photos - but hey, it's my blog I can do whatever I blooming well want! 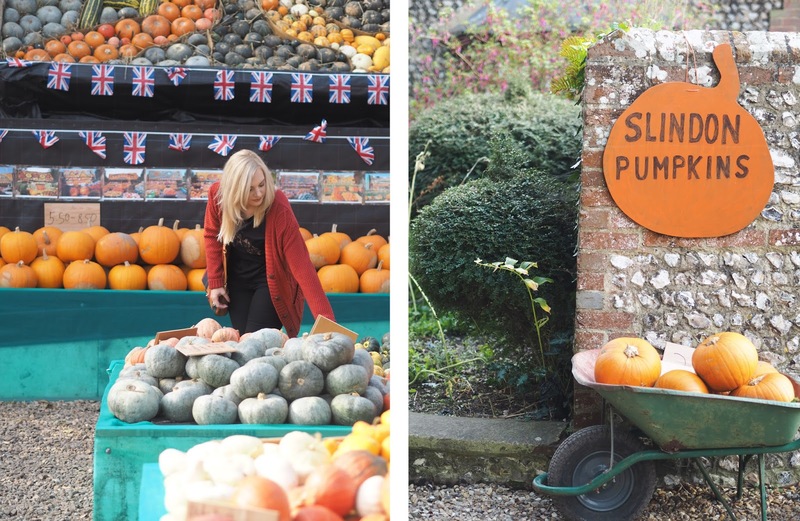 I'd been dying to get some good pumpkin shots this year and be a complete blogger cliche! So when we visited here I knew I had to pick out something orange for the occasion. 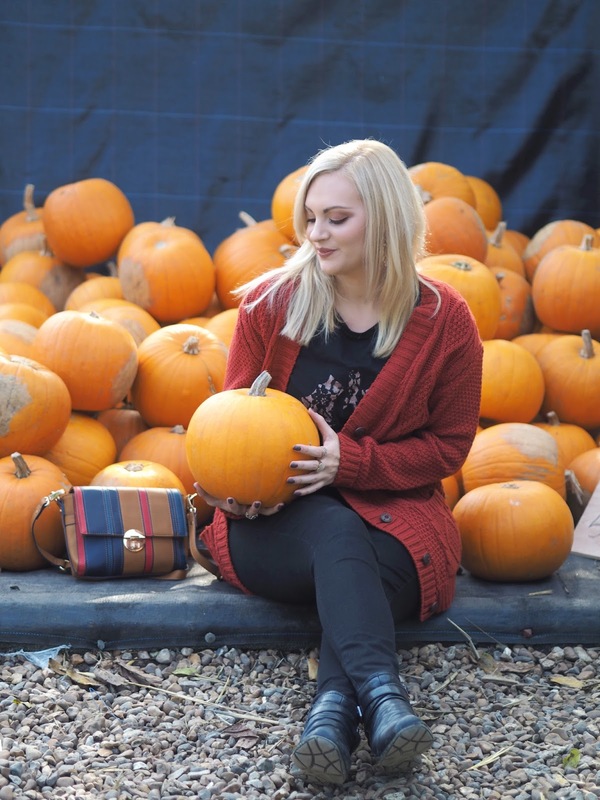 I chose the knitted cardigan from Boohoo which I bought a couple of years back - however they do have some similar ones available here. 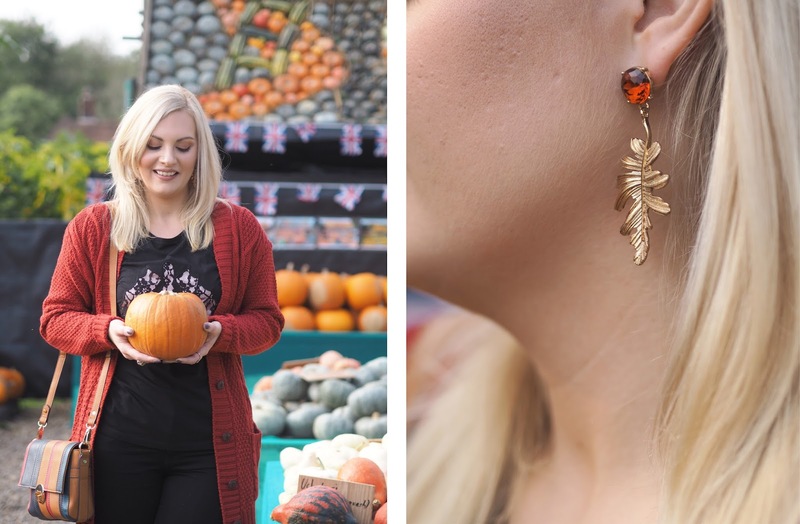 I paired it up with this Lace Bat Tee from Next and also broke in my new Autumn Leaf earrings from ASOS which I think are just so pretty! 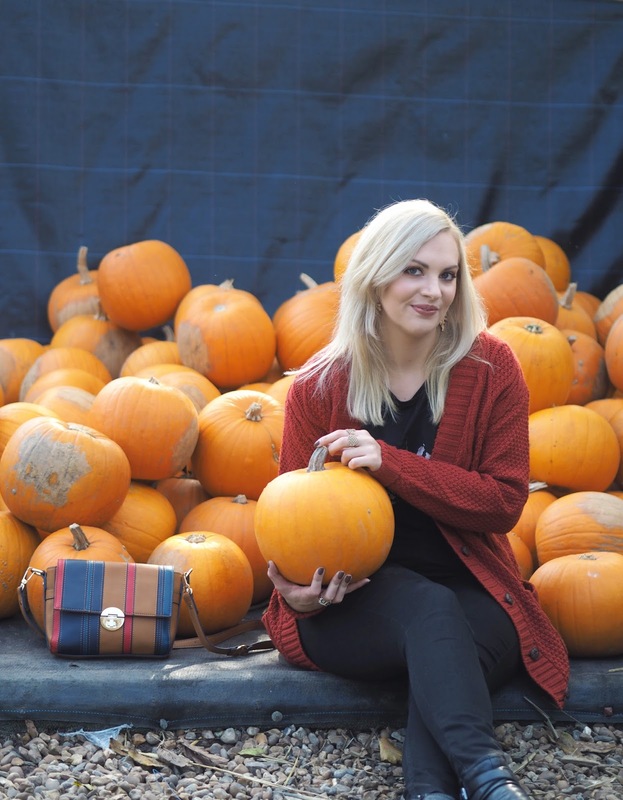 I had such fun prancing around with the pumpkins getting shots although I wasn't easy at times, mainly avoiding other people getting in shot (classic blogger problem) plus pumpkins are super heavy to hold! Also it was kind of awkward for me getting up from the floor in one for these shots (poorly joints and all!) and I needed help but hey, anything for that perfect insta shot right?! 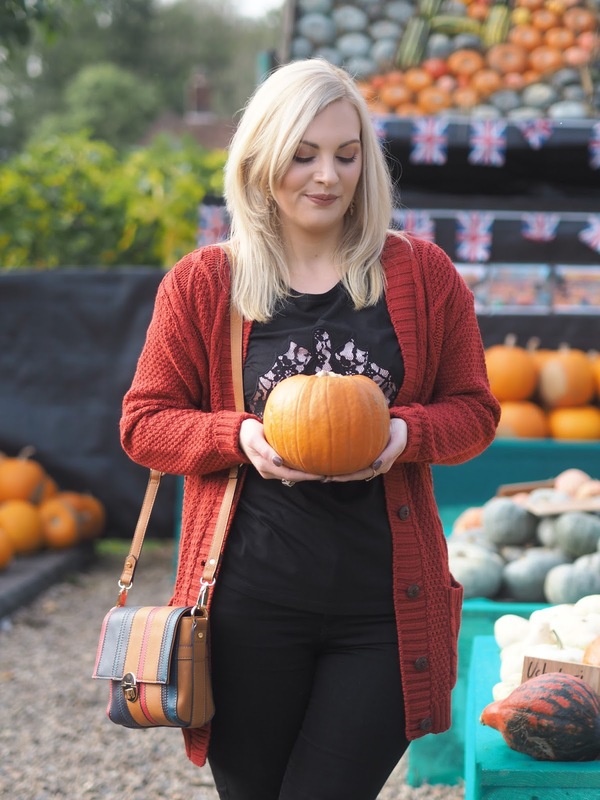 Outfit Details: Lace Bat Tee | Orange Knitted Cardigan | Black Skinny Jeans | Ankle Boots | Bag (similar) | Leaf Earrings | Rings. Other colours I like to wear in Autumn are burgundy and deep green or khaki. 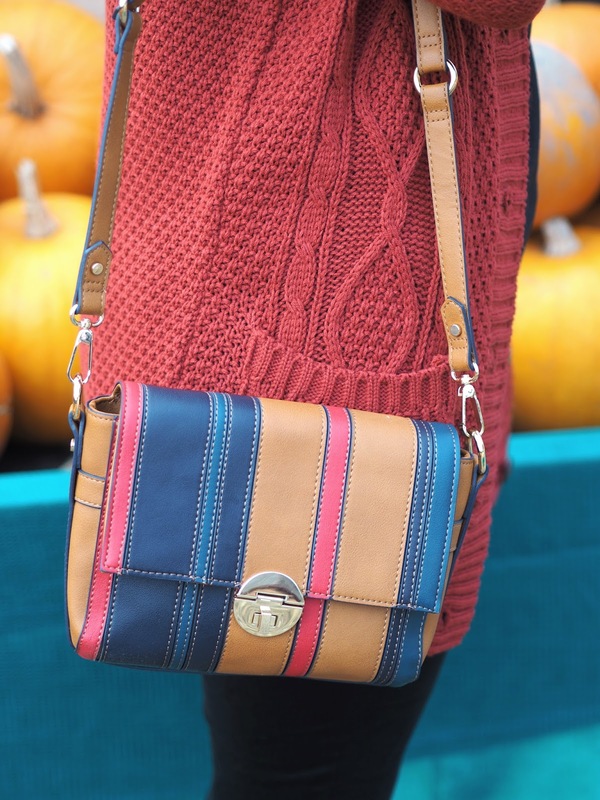 What are the colours you have enjoyed wearing this season? I am really loving your outfits :) The skirt is gorgeous.